Make sure ask yourself important questions before you buy a car! The feeling of owning a car can be liberating. No longer will you have to rely on your parents or friends to use their car: you will have your own. As nice as that sounds, there are some things that you need to think about before making a purchase. A car purchase is one of the biggest investments that you may make in your life. Getting it right can save you a lot of time, money and stress! How much you can afford. Most car dealership websites have estimate calculators for every car. You’ll be able to see how much your loan will be and what your monthly payment will look like. What kind of car you want. 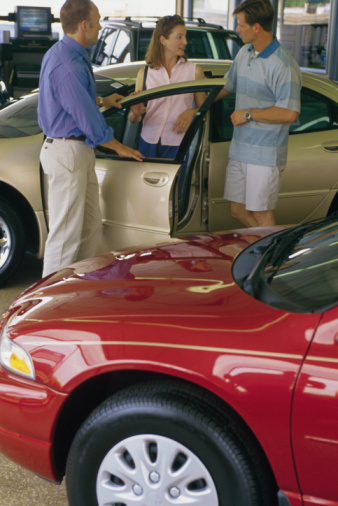 Decide whether you want to lease or own a new or used car. Depending on how long you will have the car for, you may consider leasing it. Taking your top three choices for test drives. You don’t have to make your decision after you test drive one car. Driving a few of your top options may give you a better idea about what you like and dislike. The costs of owning the car. The sticker price may be cheaper for that 1998 Chevy than it is for the 2012 Nissan, but there are other costs associated with car ownership that may make one the cheaper option. Think about things like insurance, mileage, equipment and labor costs. Narrowing down your choices starts with critically thinking about what you want in a car. Remember to think about what’s really important to you before deciding on a car. After you have bought your new ride, come see us to register and title your car! We’ll work with you to get your MVD needs taken care of as soon as possible. Get in, done and on your way ASAP!